Writing code is becoming a universal skill with boundless opportunities. Thinking like a computer – in logic, functions, loops, and objects – has its advantages. Computational thinking is rooted in logic and mathematics, but also requires creativity and ingenuity. With a basic proficiency, coding is a lot of fun. You can think of something – a game, puzzle, graphic, or web page- then write a program to create it; all you need is a computer and the Internet. Perhaps children start programming imaginary worlds rather than using traditional wooden building blocks. 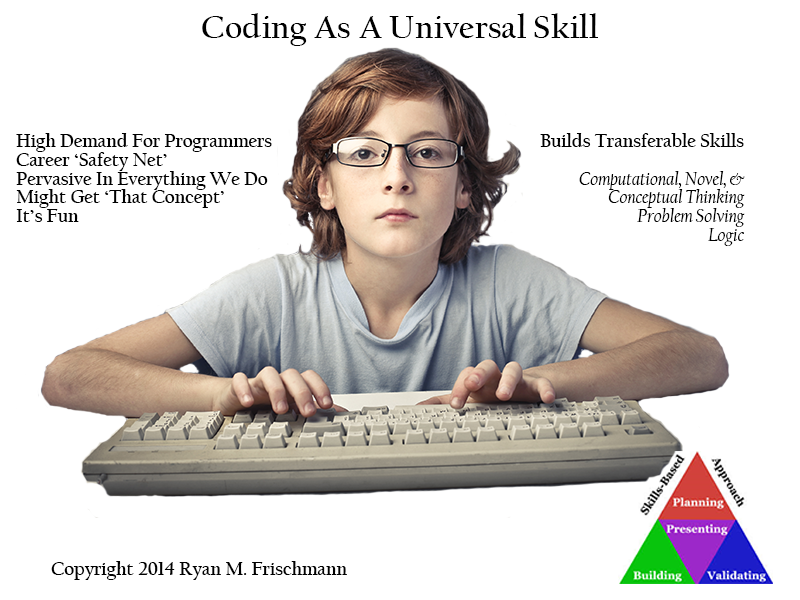 There are a few reasons why exposing children to programming is advantageous. First, as mentioned in the directive above, there are many transferable skills related to programming: problem solving, computational thinking, and novel thinking. Second, the results of programming – software and hardware applications – are used in every discipline and subject. It is useful to have basic coding skills. Third, there will always be high demand for programmers. Programing knowledge is a good career safety net. Finally, like learning a foreign language, children build coding skills faster. Future creativity might be stifled if we do not have an underlying concept of how programs work. Many of our current applications are extremely complicated and require years of knowledge to even make a contribution. It makes sense to get students learning about programs early in their education. Coding is powerful because you can program just about any concept: business processes, games, websites or mobile applications, and productivity boosters. All it takes is an understanding of how programs work, an underlying framework, and some imagination. I learned basic coding skills in college as part of a computer applications minor. I practiced coding in my first job out of college where I created an order entry application for a small company. Throughout my career, I have coded a countless number of solutions: music store for a rock band, art gallery portfolios, sales and profitability application for a foreign multi-national, a personal website platform, a video gaming league, summer camp registrations, etc. The thing I love about coding is its flexibility – you can code just about anything; there is a solution to every problem. Previous Previous post: Why Create Content?